His close ties to the Catholic Extension he'll soon oversee highlighted in this morning's report, on a quick return to Chicagoland for the home-mission society's annual meeting of bishops – at which he was already scheduled to speak on Pope Francis and the economy – within the hour (yet before tonight's Bears game, for which he was duly vested) Archbishop-elect Blase Cupich gave his second press conference in as many days, which ran live and wall-to-wall across the nation's third-largest media market. To give due credit on several fronts, the first part of the headline above comes thanks to the Chicago Tribune's Manya Brachear Pashman, whose return from maternity leave – and a weekend trip to Atlanta for the annual Religion Newswriters' Conference – were both sped up to cover the appointment. 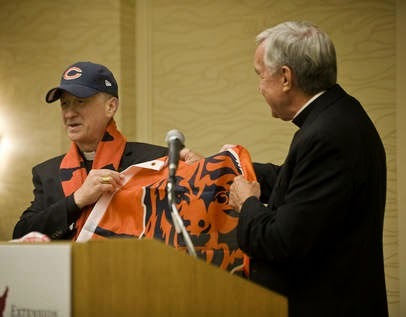 SVILUPPO – 7pm CT: Further confirming the sense that a new era is off to a running start, just before 5pm Central, the community of Mundelein Seminary received word that Cupich – himself the rector for seven years at Columbus' Pontifical College Josephinum – had informed its leadership that he will preside at tomorrow's morning Mass and meet afterward with the house's faculty. 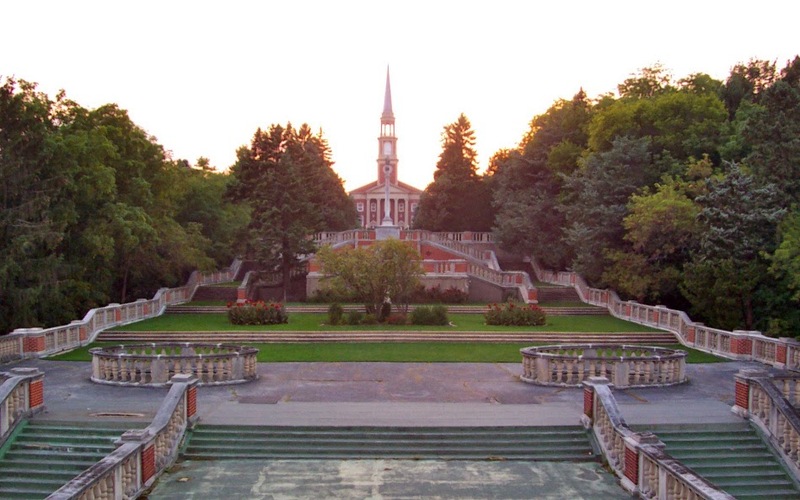 Arguably the crown jewel of American Catholic seminaries, since 2012 the 600-acre "Enchanted Forest" (its chapel seen below) has been overseen by Fr Robert Barron, a darling of church conservatives who's attained a degree of "rockstar" status through his popular films on the New Evangelization and widely-circulated commentaries on pop culture. Indeed, such is the rector's cachet that his name was prominently floated in the Italian press over recent weeks as a potential "dark horse" for his hometown appointment. On another front, meanwhile, a certain detail is infinitely telling: despite lacking the canonical or civil authority of office until November, among the Chancery staff, the understanding has apparently taken hold that Cupich has little affinity for the interim qualifiers of "-elect" or "-designate," and prefers to be referred to today as simply "Archbishop." In other words, "White Thunder" isn't just living up to his Lakota name, but the personal mandate he's been given, to boot. SVILUPPO 2: So it seems, the rapid Mundelein visit's just the start of the blitz – Tuesday afternoon will reportedly see Cupich meet with the archdiocesan central staff at its twin offices in the Quigley and Meyer Centers. In Chicago's Wake, "Riding the Wave"